This sorbet is made from the fruits of Opuntia Ficusindica. 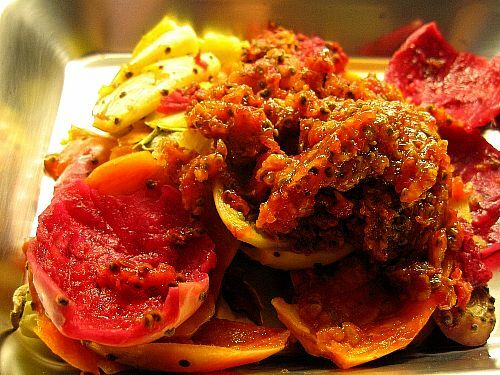 They are known as Cactus Pear or Prickly Pear in English. In French this fruit is called Figue de Barbarie, litterally 'Barbaria fig', from the old name of North Africa. And indeed that is where the gentlemen who sold me a kilogram of these intriguing fruits coming from. The fruit itself is Sicilian, as you can see from the photo. Above you see the fruits on the tree, here at the Etablissements Kuntz in Frejus, the largest wholeseller of succulent plants in France. The difference in color is apparently not a reflection of the maturity nor the taste. The barbs are mechanically removed when they pick up the fruits, but they are dangerous to manipulate nonetheless. You need to peel them with fork and knife. Here, on my modest Ikea cutting board I was ready for the challenge. First cut both ends off with a knife. Make sure you never touch the skin. The tiny barbs cannot be seen but they sure can ruin your afternoon. They get on your cloths and from there wait for days for the opportunity to make it under your skin. 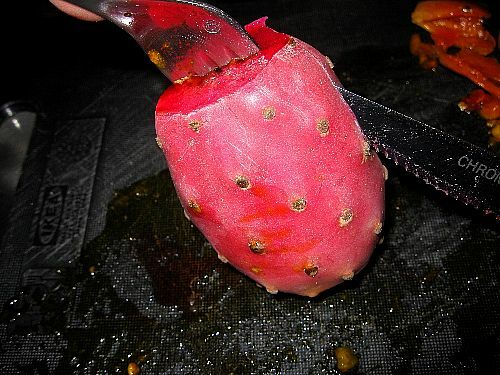 Prick with a fork and cut the fruit in half. Use the knife to detach the skin from the flesh. Here you see all three fruit colors I got in my batch. 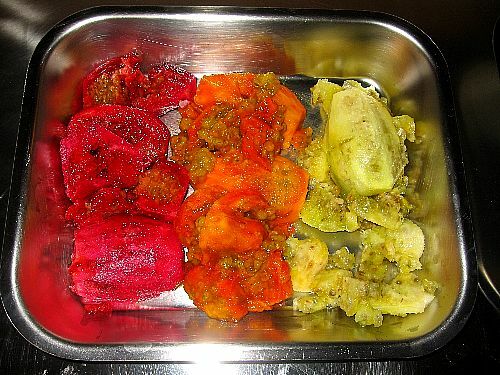 Beetroot red, pineapple yellow and sweet potato orange. Nice! Here are the skins ready for the bin. Lovely colors, even in artificial light! The flesh sorted by colors. Notice how many seeds there are inside. Put the flesh in a mixer, here my manual stainless steel moulin à légumes. Crush them to get all the juice out. Don't worry if some seeds pass through. Here is the result - it looks like freshly squeezed orange juice. Notice the different color patches, I haven't mixed it yet. 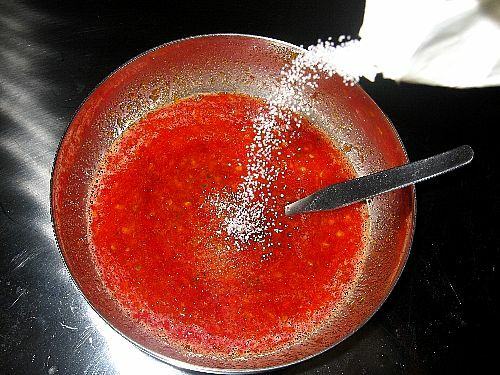 Add some sugar until you are pleased with the taste. Don't overdo it, the fruit is very sweet already. Now you need to season your sorbet. The prickly pear has an interesting taste but it is rather bland. You need to add acidity. 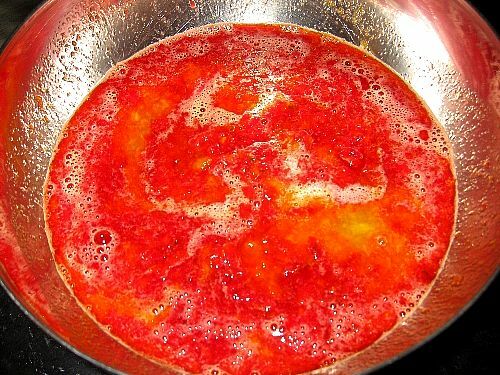 Use the juice of blood red oranges, lime or lemons until you are pleased with the taste. Add some more sugar to balance the acidity as needed. You can also add vodka or, more appropriately, 100% Agave Tequila. Now the second funniest part after peeling the cactus. The sieve. 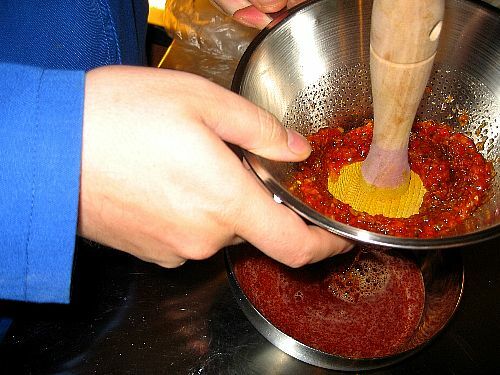 There are still many seeds in the mix and the sieve will get you a smooth liquid. 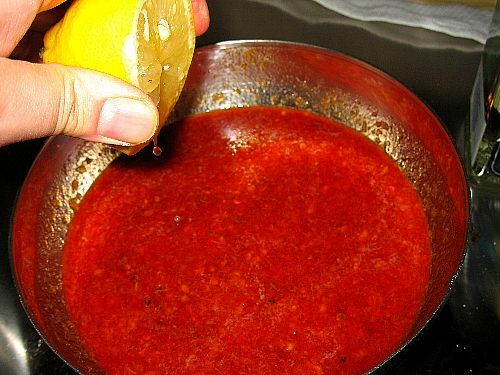 It's better to sieve it after seasoning as it mixes the ingredients better and you won't need to heat the mixture to dissolve the sugar. 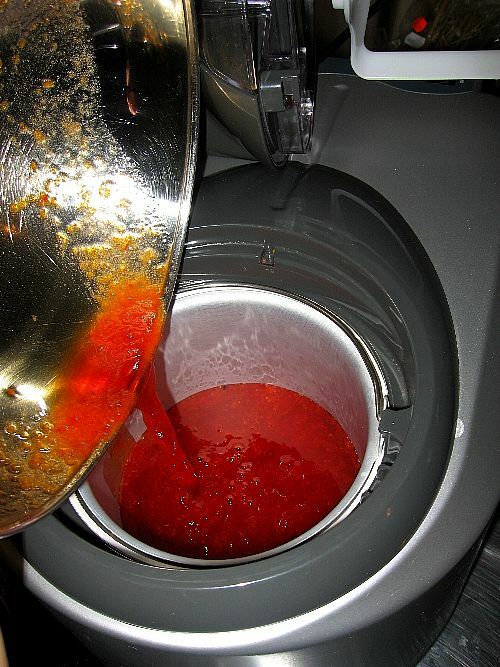 Refrigerate the mixture and pour it into the sorbet machine. When the sorbet is hard, stop the machine and remove the blades. 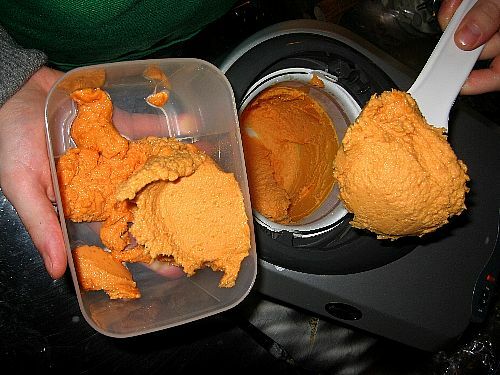 Scoop it out and put in a freezer box. Freeze it before your serve. This sorbet is really exceptional when served drizzled with lime juice and tequila. The sweetness of the prickly pear contrats beautifully with the tartness of the lime. The distilled agave - T Tequila - complements it perfectly. The best part is the bits of lime flesh frozen inside the sorbet. They are crunchy and packed with acidity and add unexpected mini explosions of pleasant tartness in your mouth. The ideal conclusion to a Tex-Mex meal. I'll have to try this out; I'd never considered it before. Prickly Pear's are like weeds here in Perth, Australia - much like fennel, but that's something else. I only ever eat them when I'm stuck at work can't get away to the shop to buy something for a snack. 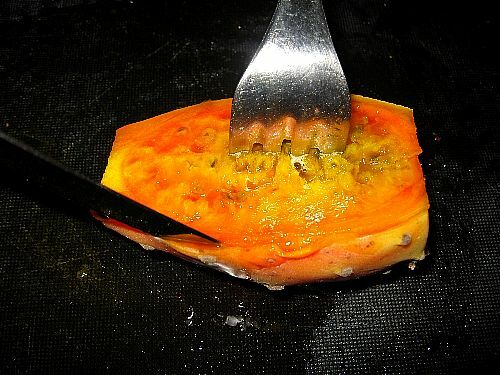 Try a tong to hold the fruit over a flame (I've read that some use kitchen torches) to burn the spines (barbs). I like it bad and hot. 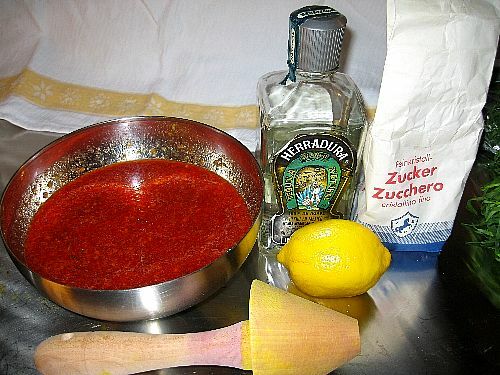 I've made prickly pear jelly before, and am planning on making it again this year.I use the ground-roll and torch method for the barbs. When picking the fruit (I go out and find them, they're wild in Oklahoma) I usually pick them off the plant (with gloves on) and roll them in the dirt. Then when I get them home I take a butane torch and tongs and burn the rest off.Then I wear some thick nitrile gloves and wash them and scrub them gently with a wire brush under running water. After that they're safe to handle with bare hands. I go out of my way to do all this work because I've had the barbs in my hands before, and they are not fun at all. Me gustó mucho tu articulo, particularmente yo las consumo frescas, con sal y limón. Hasta luego!!! Thanks for the tip Mr Thinker, I'll use garden gloves next time! Thank you! This is so clear, love the ddirections and the pictures. 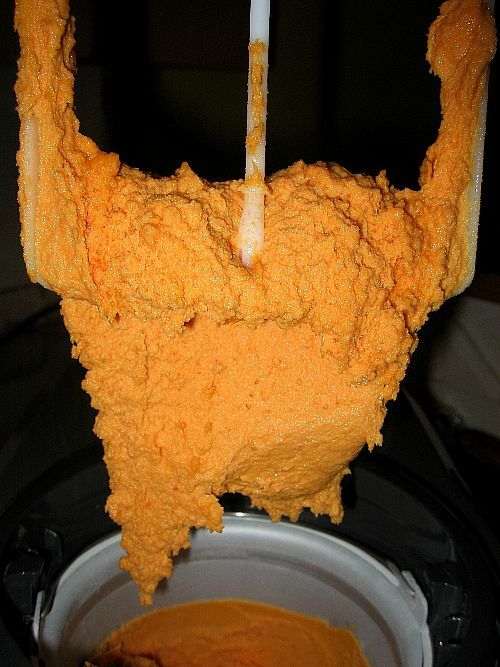 I just ordered an ice cream maker so when i receive it i will try a variation of this. 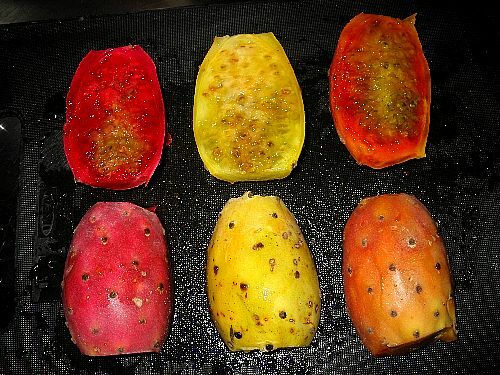 we have prickly pears in the yard at my parents summer house and i have always had the feeling that they are edible even though they look different than the ones i have seen in the grocery store. 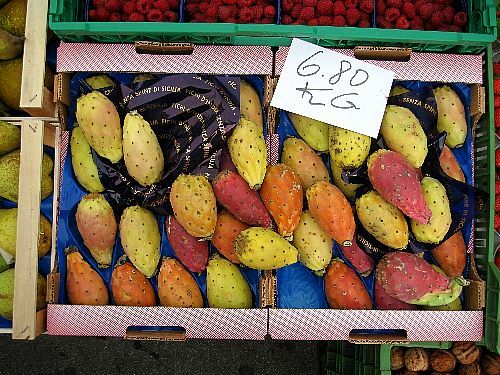 i tasted one, but wasn't certain they were of a variety you could eat, so i was doing some internet research on prickly pears to find out. i can't identify them as a specific species but i haven't read that any are poisonous, so i decided to take my chances and make a puree with them. 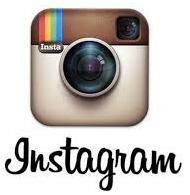 found my way to your page because i was looking for a way to de-seed them. 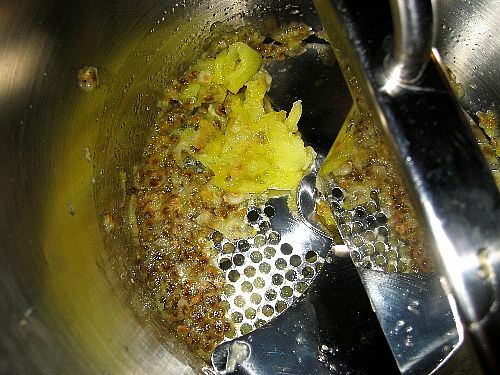 i considered putting them in the blender then straining, similarly to the way you did, but i was concerned that because the seeds are so hard that they might damage the blender blades. i don't have a manual mixer like you do. do you think i should be concerned about that? (it's my parents blender!) thanks! Ginger, thanks for visiting, you are very lucky to have such a majestic tree in your folks' garden! All you really need is the juice, so you could just scrape out the flesh and seeds into a clean towel or T-shirt, and squeeze it to get all the juice out. No need for fancy mixers! I do think that the "Cactus Pear" came from America, since it is used in the Mexican Shield etc... still, it may be a variant species or something that came from Sicily. I love the Tunas (as we call them in mexico) and i'll try your Tequila-Lemon-Tuna Sorbet the very next season of the fruit :) THX! FX's answer→ Cristobal, no doubt our friend the Opuntias came from the Americas. They became very much in fashion in the 16th century and there are all sorts of engravings showing potted prickly pears. You can read all about it in the great book called "A History of Succulent Plants", warmly recommended. Good luck if you try the recipe! We have them here and after peeling them, I hold one in my hand and use a screened seive to separate the seeds by "grating" the pear on the wire mesh. Works perfectly! This sorbet idea is great, must try, thank you. to get rid of the barbs you can rub them on a brick or burn them. Then instead of cutting the skin off, you can just cut the ends off and then cut a line from top to bottom and peel the skin off. FX's answer→ Thanks for those tips, Tara! One of my favourite fruits. They are good when chilled and eaten during a hot evening. In Cyprus they are called papoutsosika. I saw them growing in California as well. A Cypriot trick - wash your hands with olive oil to get the nasty barbs out. FX's answer→ Thanks for the tip Haik! 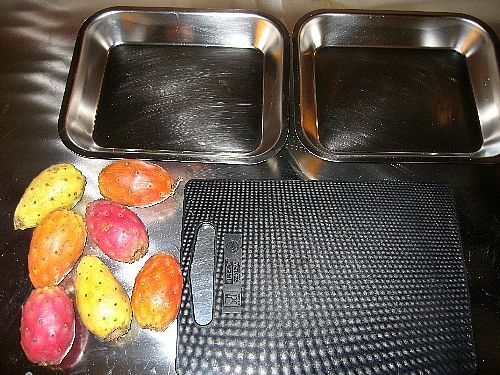 I want to make Tuna gelato, would you pls send me a recipe with this special fruit. Got to try the burn method, I had just used a spoon or butter knife and rubbed tiny spines off under running water, time consuming. After that I just cut them in half throw them in a tall pot add some water and let them simmer/boil until the pears turn to mush, then filter with cheese cloth, no seeds and all juice. FX's answer→ Good tip, thanks! I had a prickly pear sorbet at a lovely Italian restaurant in Encino, CA back in the late 90's. The chef didn't bother to take all the seeds out and it didn't bother me a bit. I lived in Mexico for years and as previous commenters mentioned, we just swallow the seeds; they're small and don't bother me at all. I prefer the 'tunas' with the pale green flesh, but any will do in a pinch. I love sorbet, but also like to eat them out of hand. We used the brick and singe method and then would just cut off the ends and slit with a knife to peel, as well. FX's answer→ Ah well then the fruit did not die in vain if he managed to spread its seed! does the alcohol affect the sorbet in any way or can I not include it for the young ones in my house? FX's answer→ Maddie you can certainly omit it!